Argand lamps with reflectors, and clockwork. Last edited by island on Sun Jan 20, 2013 11:15 pm, edited 1 time in total. Does anyone know why Cape Bonavista was never 'upgraded' from this reflector system to a Fresnel lens? From reading the history of this light, the original sixteen lamp lighting apparatus was well worn and judged needing prompt replacement. The lead time from ordering to receiving a new Fresnel lens was as long as a year to two years depending on the order of the lens and if fixed or rotating. This lighthouse exhibited an alternating red and white flash pattern thus requiring a rotating lens multiple flash lens. 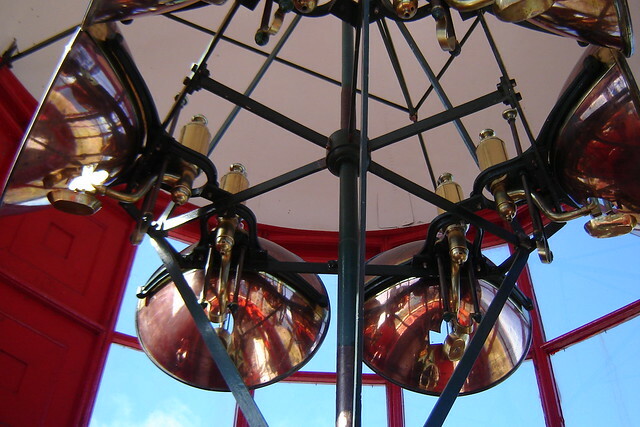 It is my guess that instead of waiting and at less cost than for a revolving Fresnel and with new lamp and new clockwork they installed previously used six lamp Argand lighting appratus that was readily available from having been replaced at a lighthouse in Scotland. Aside from this conjecture I have no clue as to why not a Fresnel. As a matter of interest the red was created by a red glass chimney as opposed to the clear chimney for white. The chimneys were not in place in the lamp photo above. I saw an image of the lamp chimneys of this light but can not seem to locate it. Cape B red lamp chimney and clockwork. and lots of neat photos on this website..